Agonia Gimdinasdotr, a dwarf adherent of Valaya, quick to help those in trouble. Blitzkrieg, a dwarf slayer, a sucker for disease, wound infection, and critical hits. Päether von Sternwart, a human diabolist, proud of himself for defeating a foe all alone. With Blitzkrieg’s injuries healed and Päether’s spell arsenal expanded the party was ready to descend into the sewers under the Labyrinth, one of Nuln’s poorest quarters. Blitzkrieg and Agonia bought some rat poison and a few wheels of cheese with themselves, hoping they can use them as bait. They broke into the sewerjack’s entrance, Agonia and Päether stole their boat, and with Blitzkrieg guiding them on the sewerside, followed the path the cultist told them about during the interrogation. There were swarms of rats everywhere. When they ran away scared there was a bell tinkling in the distance, but the adventurers couldn’t figure out what it was. When they reached the breach in the wall they were looking for the boat bumped into something. A skaven with rebreather jumped out of the water, and attacked the boatman. 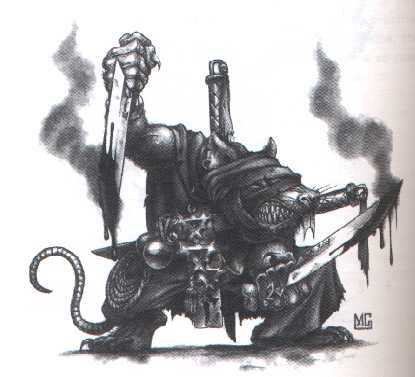 After getting an axe into his face and realizing the numbers are not in his favor he threw a smoke bomb and tried to escape, but Päether pushed the boat forward and blew the ratmen’s head off with magick missile. The adventurers looted the various poisons, and warpstone dust from the corpse.